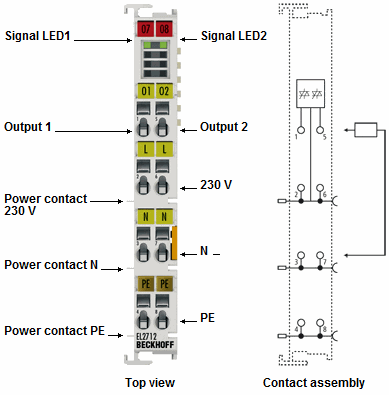 The EL2712, EL2722 and EL2732 output terminals use a power switch to control mains voltage from 12 V to 230 V AC. The switching element is a triac, which is connected to the power contact potential. As a semiconductor switch, it is not subject to wear. The steady load capacity of a digital output is 1 A. 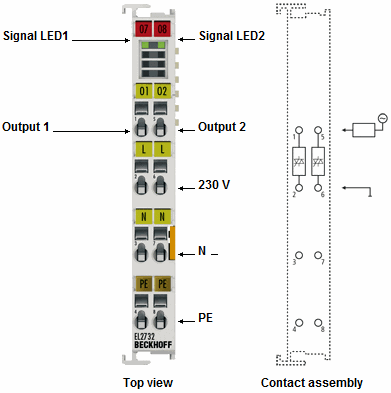 The EtherCAT Terminals have two independent outputs and indicate their signal state by means of light emitting diodes. The EL2722 has two mutually locked outputs and is very suitable for turning motors (blinds).